Erano a Cap'Découverte (Francia) per il RIO France Event 2014 venerdì scorso, stasera sono a S. Vito di Leguzzano (Vi) al Centro Stabile di Cultura: Doctor Nerve. Doctor Nerve found its roots in the Creative Music Studio (CMS) in 1980. It was there that Nick Didkovsky took a composition class with Baikida Carroll and Dave Holland. Baikida’s deceptively simple homework assignment was to “write two lines of music that fit together.” Didkovsky brought his two lines back to the studio the next day, sketched the music on the blackboard, and after a few moments twenty student musicians locked into the groove and studio exploded with excitement. Baikida started improvising over the top, while Dave was playing electric bass and smiling radiantly. The experience was very powerful, both musically and emotionally. It laid the foundation of the early Doctor Nerve sound: heavy, modular grooves, spiky horn lines, complexity that nevertheless was felt deeply in the body. 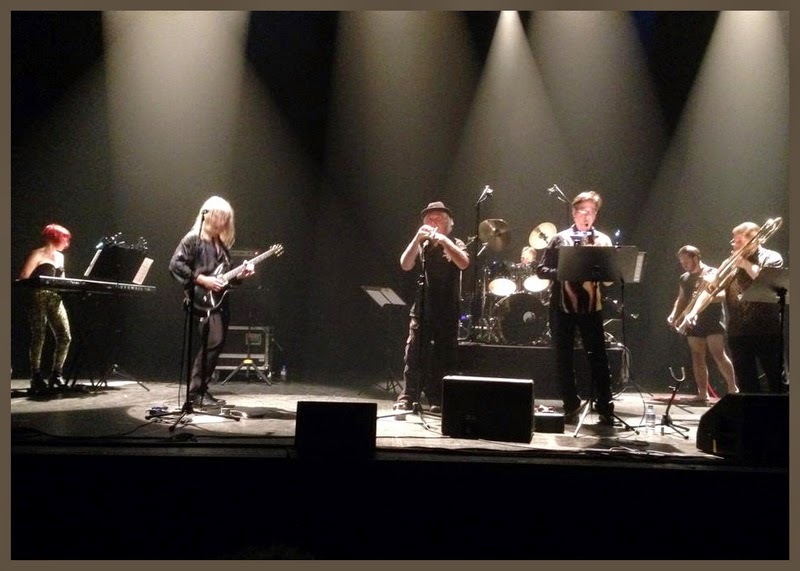 Further influenced by the sound of the New York City bands like Noise R Us (Jim Matus, Phillip Johnston) with its successful fusion of heavy rock guitar and counterpuntal horns, Didkovsky saw the potential for an instrumental rock band. Nick met saxophonist Yves Duboin and drummer Leo Ciesa at CMS. Early versions of Doctor Nerve grew out of their collective experience. When Nick moved to New York City in 1983, earlier incarnations of the ensemble solidified. The band took the name Doctor Nerve, adding Dave Douglas on trumpet, Michael Lytle on bass clarinet, and other players who were carving out their place in the downtown New York scene. Didkovsky self-produced the first Nerve LP, which was later re-released on the German label No Man’s Land. The success of the first record led to the Cuneiform Records release of Armed Observation which was produced by Fred Frith. Concert appearances at the Moers Festival, FIMAV, Musique Action and other international shows helped push Nerve’s momentum forward. The history of Doctor Nerve is marked by restless experimentation. Didkovsky’s work with computer assisted composition gave birth to a number of idiosyncratic Nerveware pieces. Inspired by John Zorn’s Cobra Didkovsky also introduced conducted improvisation to the band. The composition Ereia saw Doctor Nerve augmented by the Sirius String Quartet, performing an hour long work in three movements which premiered at the FIMAV Festival in Victoriaville, QC. Today Doctor Nerve consists of a stable line up of players. Trumpet beast Rob Henke leads the four piece horn section. Jesse Krakow (Dot Wiggin Band, Fast ‘n’ Bulbous) has held down the bass chair for a few years now. The virtuosic talents of keyboardist Kathleen Supové and trombonist Ben Herrington (Meridian Arts Ensemble) raise the game of the band and point to an exciting future.